In California water damage can be a problem throughout the year. At PuroClean Home Rescue, we take water damage seriously (24x7). 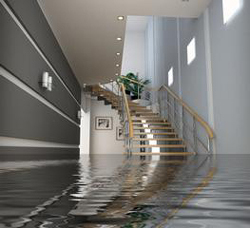 Call 866-722-7876 for immediate water damage services in Sacramento, Tahoe and all surrounding areas. We offer 24-hour emergency response, because whether you have suffered water damage in your home, or your business, time is your worst enemy. When you've had water damage, you’ve got to take immediate action. Allowing a wet carpet, wall, vanity, flooring or furniture to remain wet is only an invitation for future problems and added expenses. Allowing a structure to soak will only cause further damage. If it’s wet, you need to dry it as soon as possible and your shop vac is not going to handle it. If it's wet, we can dry it! 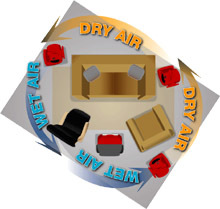 We specialize in Water Extraction, Structural Drying, and Contents Drying. Contact PuroClean Home Rescue now, and we can help you start the process of restoring your property before the water damage worsens. • If possible, identify and eliminate water source, calling a plumber if necessary. • Sort through wet items that you would like to try and save. • Wipe water from wood furniture after removing lamps and tabletop items. • Place aluminum foil or plastic between furniture legs and wet carpeting. • Turn on Air Conditioner in summer or heat in winter, temperature should remain between 72 - 76 degrees. • Leave wet fabrics in place, dry as soon as possible. • Use your household vacuum to remove water. • Use TVs or other appliances while standing on wet carpets or floors, especially on wet concrete floors. • Do not put wet contents on top of dry contents. • Do not wait! Call PuroClean Home Rescue; we are available 24x7. A good rule of thumb: water that comes from the top down is generally covered by your home or renters insurance, but when it comes from the bottom up as in a flood, it's generally not. Flood insurance should be considered by every homeowner. Statistics show 26% of losses come from areas that are not deemed as flood zones. Even a small amount of water can cause serious damage to your home. So it's important to have a good water IQ. If you haven't done so in a while, be sure to review your homeowner's insurance policy with your agent so you know what's covered and what's not, and be aware that all homes are at risk for floods. Flooding - Is Sacramento next? Is My Water Damage Loss Covered?